^ Elgood, Robert (1995-11-15) (英語). Firearms of the Islamic World: in the Tared Rajab Museum, Kuwait. I. B. Tauris; First Edition edition. p. 33. ASIN 185043963X. ISBN 978-1850439639. ^ Hall, BertS (1997-05-12) (英語). Weapons and Warfare in Renaissance Europe: Gunpowder, Technology, and Tactics (Johns Hopkins Studies in the History of Technology). The Johns Hopkins University Press. p. 212. ASIN 0801855314. ISBN 978-0801855313. ^ a b c d e f g h 歴史群像 2005, p. pp.96-97. ^ 歴史群像 2005, p. pp.94-95. ^ Noel Perrin (1988-01-01) (英語). 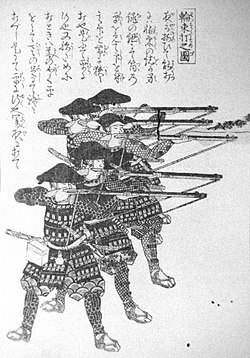 Giving Up the Gun: Japan's Reversion to the Sword, 1543-1879. David R. Godine. ASIN 0879237732. ISBN 978-0879237738. ^ 歴史群像 2005, p. p.92. ^ a b c 歴史群像 2005, p. pp.98-99.